This diagnosis detects a very large leak (fuel filler cap fell off etc.) in EVAP system between the fuel tank and EVAP canister purge volume control solenoid valve. Never remove fuel filler cap during the DTC CONFIRMATION PROCEDURE. • Open engine hood before conducting the following procedures. 1. Tighten fuel filler cap securely until ratcheting sound is heard. 4. Turn ignition switch ON and select “DATA MONITOR” mode with CONSULT-III. 5. Make sure that the following conditions are met. COOLAN TEMP/S: 0 - 70°C (32 - 158°F) INT/A TEMP SE: 0 - 60°C (32 - 140°F) 6. 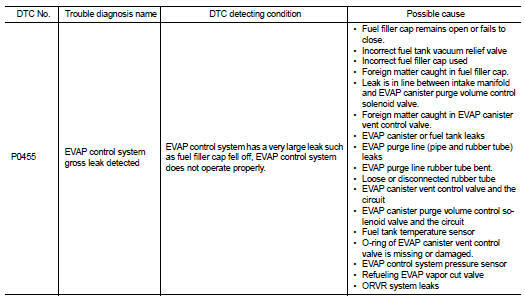 Select “EVAP SML LEAK P0442/P1442” of “EVAPORATIVE SYSTEM” in “DTC WORK SUPPORT” mode with CONSULT-III. NG >> GO TO 3. Which DTC is detected? P0455 >> Go to EC-331, "Diagnosis Procedure". P0442 >> Go to EC-296, "Diagnosis Procedure". NOTE: Be sure to read the explanation of DIRVING PATTERN in EC-530, "How to Set SRT Code" before driving vehicle. Is 1st trip DTC detected? YES-1 >> P0455: Go to EC-331, "Diagnosis Procedure". YES-3 >> P0441: Go to EC-292, "Diagnosis Procedure". Refer to EC-334, "Component Inspection". Check EVAP purge line (pipe, rubber tube, fuel tank and EVAP canister) for cracks, improper connection or disconnection. Is there any leak in EVAP line? YES >> Repair or replace. NO-1 >> With CONSULT-III: GO TO 9. NO-2 >> Without CONSULT-III: GO TO 10. Is the inspection result normal? YES-1 >> With CONSULT-III: GO TO 12. YES-2 >> Without CONSULT-III: GO TO 13. 2. Perform “PURG VOL CONT/V” in “ACTIVE TEST” mode with CONSULT-III. Check that engine speed varies according to the valve opening. Does engine speed vary according to the valve opening? YES >> GO TO 14.